So You’re Considering Skipping the Family Thanksgiving This Year? So you’re thinking of skipping the family Thanksgiving celebration this year, sorta, kinda, maybe? You’ve always made the trip to Grandma’s in Gary or Uncle Harold’s in Highland Park or the cousins in Cupertino, but this year? With the prospect of getting dressed down over your voting choices while passing the cornbread stuffing? Yikes, no appetite and Thanksgiving’s still two days away. The last thing you need is another blogger telling you how to survive an unsavory political debate during The Meal. Gnawing on a turkey leg while muttering, “interesting” is nothing short of unoriginal. And every time a peppery comment comes your way about those people who voted for so-and-so you’re sure you’ll gag on the green bean casserole. Conflict erupts when two people try to occupy the same space at the same time. You’re thinkin’ this may be a mighty good year to avoid those verbal collisions. So no Post-Election Survival tips here. A simple story will do. I’m never so pleased as when lots of feet are under our table. The unexpected gift of a Thursday at home with nothing to do but cook for people I love or some that just need loving? Yes please. No elbowing through the crowds at the airport for me, but any and all are welcome to sit a spell and eat their fill at Rowes’ Garden. Until last year. 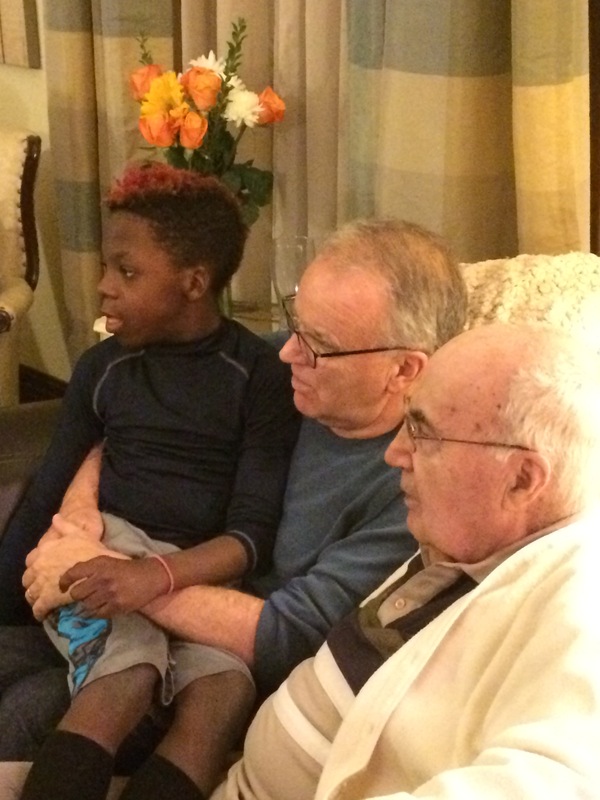 Poppa, at 92 the dearly beloved patriarch of the Rowe family, has surprised and gladdened us all with his longevity despite a six-way bypass years ago and a heart that wants to quit on a life that never has. Mama Rowe reaches gamely for memories that refuse to linger long enough to stick. Let’s drive to Buffalo, Mike says to me. If we leave on Wednesday we can have two whole days with Mom and Dad and Sue’s gang before we need to be back. Who knows if…and after 40 years of marriage, I do know. Come, ye thankful people, come, Raise the song of harvest home! All is safely gathered in, Ere the winter storms begin; God, our Maker, doth provide For our wants to be supplied; Come to God’s own temple, come; Raise the song of harvest home! 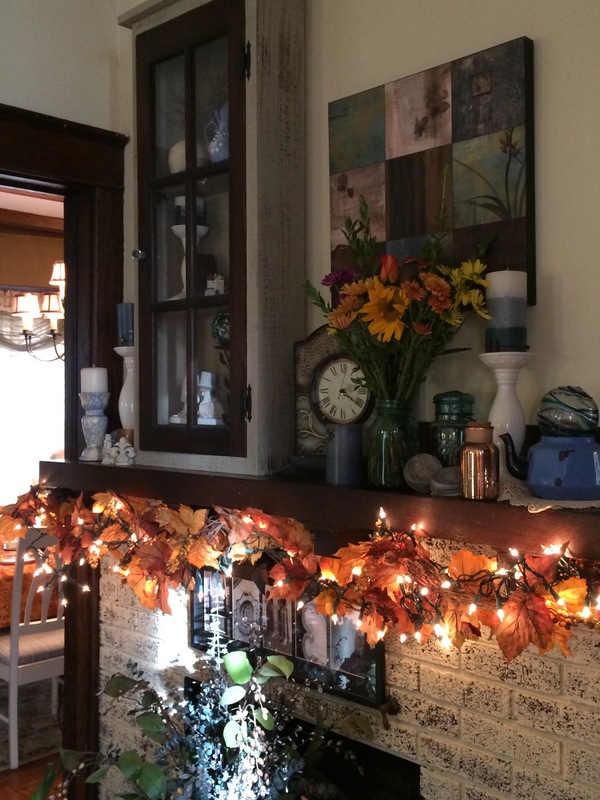 Harvest and home. We motor across hundreds of miles of fields sporting buzz cuts in the late November dusk. Niece Jennifer welcomes us with a glad cry and wrestles another table into her dining room. Sara and Greg and their kids pile in from Pittsburgh. Oldest sister Jeannine flies up from Hilton Head. 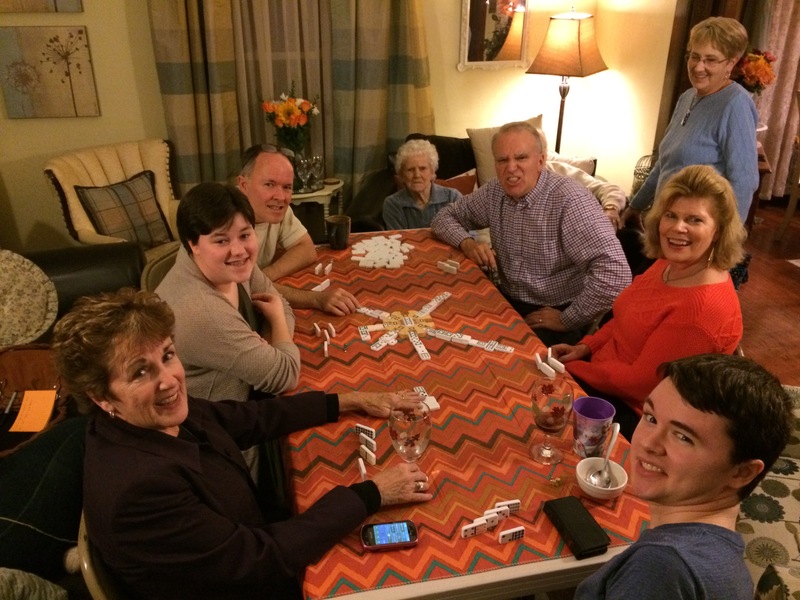 Four generations of cousins and aunts and uncles jockey for room at the table, bantering as only people can who have decades of shared history together. All wants are supplied on this day of feasting and family. We ourselves are God’s own field, Fruit unto his praise to yield; Wheat and tares together sown Unto joy or sorrow grown; First the blade and then the ear, Then the full corn shall appear; Grant, O harvest Lord, that we Wholesome grain and pure may be. Wheat and tares. We don’t all agree on how the country should be run. How can we? Why should we? But as Americans we are planted together in God’s own field, joys multiplied, sorrows shared. And when it comes to family? Nobody in this place need audition to belong. For the Lord our God shall come, And shall take the harvest home; From His field shall in that day All offenses purge away, Giving angels charge at last In the fire the tares to cast; But the fruitful ears to store In the garner evermore. Then, thou Church triumphant come, Raise the song of harvest home! All be safely gathered in, Free from sorrow, free from sin, There, forever purified, In God’s garner to abide; Come, ten thousand angels, come, Raise the glorious harvest home! Sorrow and sin. We’ve borne witness to both. But for today, as arms extend around the table of grace? That which unites us is so much greater than that which divides us. The hand gripping yours holds you both steady in a crazy, tilting world. So some national leader is on a bender and another has gone amuck? It matters, ‘course it does, and there’s a proper place for protesting and letter-writing and opining in the papers. But not here, not today. My husband brings lunch to my office today. He pulls out his mobile and dials Home. And the miracle barely dreamed of a Thanksgiving ago? Poppa’s voice comes on the line with strength and gladness, Mama’s too. Another holiday has come round and them with it. The eternal harvest we sing of on Sundays has not yet come for them. You never know, do you, if that holiday gathering you choose to forego might be your last, or theirs? Because that eldest sister, our beautiful Jeannine? We made haste to Buffalo last Thanksgiving in case it was our parents’ last. And it turned out to be hers. You never know. No, you never do. But this year, friend? You still have a choice. November 2015: Jeannine standing behind Mike and me. Our last Thanksgiving together. Love you and love your writings, Maggie. Always so personal and real. Thank you! 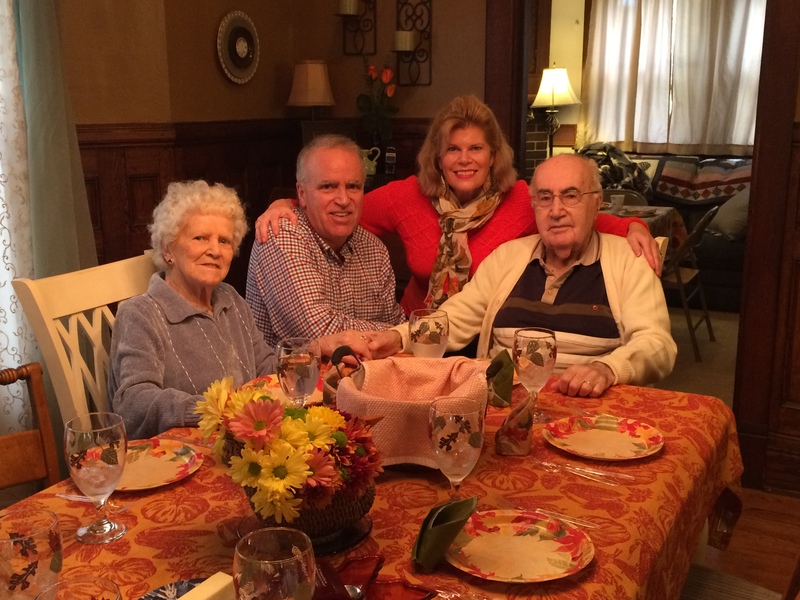 Loved seeing Jean and Vern…love those two! Happy to have you back on the blog, Maggie, and for this lovely reminder to cherish our loved ones all we can. Katherine, it was your kind comment recently that encouraged me to approach the keyboard again after months of silence. Thank you! Beautiful, Maggie. Thinking of you this Thanksgiving. Such great thoughts. I hope everyone will take the time to read over and consider. Last year my father died at 91 just before Thanksgiving. This year 6 of my family gathered to honor his wishes and put his ashes in the grave in Japan where my mother’s remains have laid for 14 years. We had such a good time and vowed to do it again. Two days later my sister fell down her steep stairs and had a major concussion and lots of injuries but God spared her life. Three days ago we discovered my 60-year-old sister-in-law has a brain tumor. You never know. You just never know. Sometimes families are a bit quirky but they are each so, so precious. Thank you for this wonderful reminder. This is beautiful, Mom. I wish we were hastening home to be with you today but we’ll be seeing you in less than a month and that makes the separation easier!